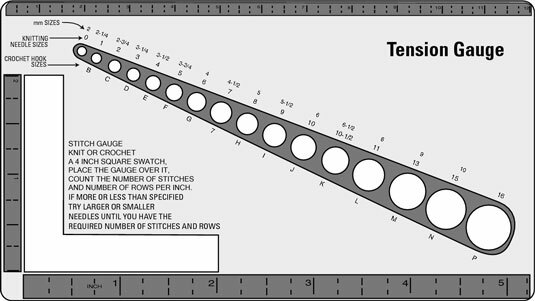 To check the gauge of your knitted or crocheted fabric, use a tension gauge. Frequently measure the gauge as you knit or crochet to ensure consistency in your stitches. Unevenness will affect the size of the finished item. A tension gauge has holes to size up knitting needles and crochet hooks, and a 2-inch × 2-inch, L-shaped window to measure stitches. Lay your knitting or crochet work flat. Lay your gauge tool on top, somewhere in the middle of the swatch. Don’t press it down so vigorously that you distort the stitches. To count stitches per inch, count the number of stitches there are across the window. Don’t forget that you have to double the number of stitches to determine the number of stitches per 4 inches. To count your rows, line up the vertical part of the window against a row of stitches and count the rows of stitches. For something that doesn’t need to fit exactly, like a scarf or a wrap, you don’t need to be nearly as fastidious when checking gauge measurements. If it looks good to you, you don’t need to fret about the numbers.